The overall non-food credit growth in 2016 (as of October 2016) grew by about 7% Year on Year. Within this, agriculture sector grew by 13% Year on Year, industrial loans declined by 2% and retail loans (includes home loans) outperformed all the sectors and grew by 17% Year on Year. One of the biggest contributor in India's banking loan book growth is housing loans. As per Reserve Bank of India (RBI) , as of 30th October 2016, it contributed about 54% to the total retail loan book of the Indian banking system. Given its high growth potential and low NPA characteristics housing has been darling sector for all the banks in India. 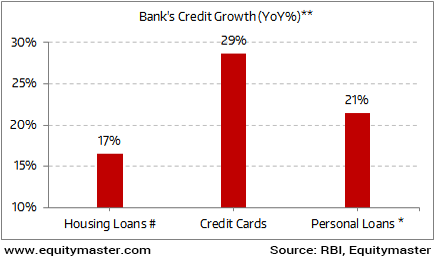 However, as per the RBI data, in 2016 growth in personal loans & credit cards surpassed growth in home loans. # Include Priority sector loans * Include Vehicle Loans, Consumer durable loans ** As on 30th October 2016. As of 30th October 2016, the housing loans grew by 17% Year on Year. Credit cards and personal loans both grew by 29% and 21% Year on Year respectively. Now since the contribution of the home loans to total retail loan portfolio is about 54%, the overall growth of the Indian banking credit largely depends on the growth of the housing sector. The recent move by the major banks to move back to the teaser loans clearly indicates their inclination towards the revival in the growth of the housing loan book.